While out and about, I noticed this strange contraption at a nearby gas station. I have parked next to it many times over the years, but never really noticed it. 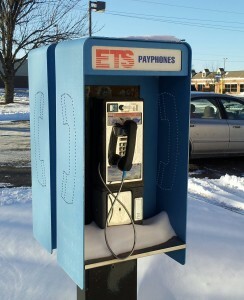 A payphone! It just struck me as odd that there are still some around. Now I have no idea if it still works. I couldn’t try it even if I wanted to! Mainly because I don’t carry any cash on me, which in turn means I have no pocket change. So there it stands, overlooked by many everyday. Have to wonder if my kids would even know what it was, let alone know how to use it IF they ever had to! This entry was posted in Podcast, The Blog and tagged Blue Springs, Broadcast, Mo., payphone, Podcast, Scott Powell. Bookmark the permalink.